Dress to Impress: Grades of clothing in the manifest of a 10th century Byzantine military expedition. So this clothing could be used as gifts to obtain the support of notable inhabitants of Crete, as well as to reward soldiers on campaign. Clothing was not only intrinsically valuable but could also have had propaganda value to the Byzantines: by 'wearing their colours', recipients were marked out by a visible sign of allegiance. Six plain inner garments (himatia esōphoria) of high value; likewise 6 pairs of leggings (touvia); 6 undershirts and breeches (hypokamisovrakia); 6 purple-dyed hoods (epirrhiptaria ochea) (II-45, 230-34). Tailored garments with two vents and collars selected from skaramangia of varied colours and patterns, decorated with a double silk border (C, 234-36). ... double borders of silk decorated with eagles and imperial symbols (C, 234-36). Judging from a contemporary chronicle, the epirrhiptarion is an item of headwear. From its literal meaning, something like throwover, it should most likely be a hood or cowl. Even though such headwear is rarely depicted as being worn by Byzantine men of any rank , a matching number of epirrhiptaria are included for every class of outfit listed in the Cretan accounts (see also below), and also appear in 'On Imperial Expeditions'. Perhaps they are indicative of the preference of the Arabicized populations of Crete and Syria. Or conceivably, a gift for the recipient's spouse? There is no footwear or belt in the koitōn list, but likely some would have been provided. Table 1 - Gifts of clothing from the eidikon, aligned according to number and quality (II-45, 236-54). One hundred and forty men received garments of better quality, of whom a subgroup of 40 got the choicest selection. 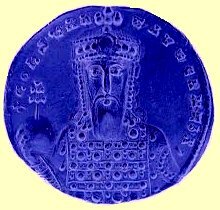 That included himatia esōphoria with matching leggings, which were presumably not so fine as those given by the koitōn - but still, with a valuation of 7 to 10 nomismata (gold coins), each costs about the annual wage of the average Byzantine soldier or citizen. A tailored garment valued at 10 nomismata was suitable for a merarchēs (commander of 1,000) from one of the border themes , however it seems more likely that these particular items were not intended for Gongyles' officers, but rather as gifts for the Cretans, as they were tailored in 'Saracen style'. Oddly, it appears that only these best forty outfits came with belts - perhaps the list only specified belts of significant value , or the other types of garments destined for the lower orders were normally worn ungirdled? Even though flax cultivation for fibre and oil is well attested in Byzantine sources , linen (linon, linarion) is rarely mentioned in these manuals. Sets of underwear (hypokamisovrakia) were produced in two grades for the Cretan expedition, but of unspecified materials - presumably they were of linen, at least for the lower grade. The better grade may have been distinguished by using a finer quality or an imported linen, though silk is not out of the question. Interestingly, no underwear was supplied with the third-quality cotton outfits. As the Emperor was not present on this Cretan expedition, the rituals described in 'On Imperial Expeditions' for distributing garments to his military commanders and royal attendants were probably not performed. In 'On Imperial Expeditions', there is a difference in that Byzantine subjects were usually presented with just a single garment, whereas foreigners were given complete outfits. So it seems likely that all of the clothing sent to Crete, which was packaged as complete outfits, was intended as gifts to win over the locals. This could also explain what may be some allowances for Muslim taste, such as 'Saracenic tailoring'; Egyptian striped fabrics; and headdress. Nonetheless, we are given a contemporary Byzantine view of what garments constituted a complete male wardrobe; and how heirarchy affected the quality of that wardrobe; as well as some details, such as their preference for matching leggings to body garments (in fabric as well as decoration). 'Expedition Against Crete': Ē kata tēs nēsoy Krētēs genomenē ekstrateia kai echoplisis tōn te ploimōn kai kavallarikōn epi Kōnstantinou kai Rōmanou tōn Porphurogennētōn en Christō pistōn Vasileōn eis ind. l'. Text and translation, in: Haldon (2000), p.218-35. 'On Imperial Expeditions': Osa dei ginesthai tou megalou kai upsēlou Vasileōs tōn Rhōmaiōn mellontos phossateusai. Text and translation in: Haldon (1990), p.94-151. ('The items sent to the King of Italy under the Lord Romanos, ...'). Text and translation in: Haldon (2000), p.214. Dawson, T. (2006). Oriental costumes at the Byzantine court: a reassessment. Byzantion 76, p.97-114. 'Dream Book' = Drexl, F. [Achmetis] Oneirocriticon. Teubner: Leipzig 1925. Haldon, J.F. Three treatises on imperial military expeditions (Corpus Fontium Historiae Byzantinae, 28). Verlag der Österreichischen Akademie der Wissenschaften: Vienna 1990. Haldon, J.F. (2000). Theory and practise in tenth-century military administration: Chapters II, 44 and 45 of the Book of Ceremonies. Travaux et Mémoires, 13, p.201-352. McGeer, E. Sowing the Dragon's Teeth: Byzantine Warfare in the Tenth Century (Dumbarton Oaks Studies, 33). Dumbarton Oaks: Washington DC 1995. Migne, J.P. (ed.) (1853). Liutprandus Cremonensus Episcopus: Relatio de legatione Constantinopolitana. Patrologia Latina, 136, cols. 909-938. Morrison, C. and Cheynet, J. Prices and wages in the Byzantine world, in A.E. Laiou (ed.) The Economic History of Byzantium, Dumbarton Oaks: Washington DC 2002, p.815-878. Oberhelman, S.M. The Oneirocritic Literature of the Late Roman and Byzantine Eras of Greece (Ph.D. thesis). University of Minnesota, 1981. ODB = Oxford Dictionary of Byzantium. A. P. Kazhdan (ed. ), Oxford University: New York, Oxford 1991. Parani, M.G. Reconstructing the Reality of Images: Byzantine Material Culture and Religious Iconography (11th-15th Centuries) (The Medieval Mediterranean, 41). Brill: Leiden 2003. Sophocles, E.A. Greek Lexicon of the Roman and Byzantine Periods (from BC146 to AD1100). Charles Scribner's Sons: New York 1900. Watson, A.M. The rise and spread of Old World cotton, in V. Gervers (ed.) Studies in Textile History in Memory of Harold Burnham. Royal Ontario Museum: Toronto 1977, p.355-68. CAVEAT: Gentle reader, these sources have been available to scholars for a very long time. I haven't conducted an exhaustive search of the literature (much is not in English). It could well that someone else has already attempted this analysis and published similar conclusions - in which case lack of acknowledgements does not equal plagarism, only ignorance (and I offer the same defense for how I transcribe Greek!). PB. 'On Imperial Expeditions', C, 223-32. 'Unseamed' may mean garments that were purpose-woven to shape rather than sewn together from several pieces. Why would untailored garments be considered more valuable than tailored ones? Weaving garments in one piece is a venerable Mediterranean tradition which requires a very large loom, and (as the vast corpus of surviving Coptic tunics shows, albeit in humbler materials) results in unique textile objets d'art rather than a manufactured item. Instead of applying strips woven on a band-loom or cut from broadcloth, decorative bands and edgings were integrally woven into the base fabric in a highly manual process. Dress to Impress: Grades of clothing in the manifest of a 10th century Byzantine military expedition, written and webbed by Peter Beatson. (c) Birka Traders 2013-14. Not to be copied without permission.